There are many sides to Spain. Or, as many Spaniards say, Las Españas – “the Spains.” The country is as diverse as it is captivating. It has strong regional identities, each with its own culture and history, which are worth getting to know. Understanding the different regions and cultures of “the Spains” will enrich your travel experience. Our country-intensive voyages are designed to immerse guests in a nation throughout an entire cruise. Sailing the Iberian Peninsula during one of our in-depth Spain cruises will show you a whole new side to the country, its unique culture, and its diverse regions. What can you expect to experience during a journey along the Iberian Peninsula? Here are seven of the best things to do in Spain. 1. Feel the Rhythm, Feel the Soul. Music and dance are integral parts of Spanish culture, and most regions have their own distinct styles and traditions. A universal theme throughout the country, though, is duende. Loosely translated, tener duende means “having soul”. That soul defines the music and dance of Spain, and the country’s culture itself. Spain is soulful, passionate, and evocative. You’re probably familiar with Spain’s most famous style of music and dance, flamenco. This emotional and evocative genre originated in Spain’s southern Andalusia region and has danced its way around the world, gaining in popularity and influence with every step. Traditionally, flamenco music features a vocalist and classical guitarist. El baile flamenco, the accompanying dance, is known for its intense passion, rhythmic foot-stomping, and customary ruffled costumes. When calling on the Andalusian city of Seville, join us for an evening of dinner and dancing at El Tablao del Arenal, where you’ll experience an authentic flamenco performance from local dancers and musicians. The Catalonia region surrounding Barcelona is best known for sardana music and dance. Sardana music is performed by a cobla—an eleven-member band consisting of ten wind instruments, a double bass, and a tambori (a small drum). The accompanying dance is performed in a circle and is a relatively simple and slow. The popular rumba catalana style of dance originated in Barcelona in the 19th and early 20th centuries. It is similar to flamenco, with Afro-Cuban influences. In Spain’s northern Basque Country, you’ll hear trikitixa—a popular style of music centered around on the accordion and tambourine. In the Balearic Islands, you might be surprised to find that a specific type of bagpipes known as xeremia are a commonly used instrument. What do you need for a cruise to Spain? Good walking shoes, a decent camera, a sense of adventure, and a hearty appetite. Spain is home to some of the most delectable food and wine in Europe. Like music and dance, Spanish cuisine varies among regions. Basque cuisine, which you’d experience during a voyage to Bilbao, is world-renowned. In fact, Basque Country has the most Michelin-starred restaurants per capita in the world. Basque dishes often include salt cod, peppers, and meat or fish that has been grilled over coals. In Basque Country, order pintxos – these are small plates similar to tapas, but unlike tapas they are not meant to be shared. The best way to discover this cuisine, we think, is through a hands-on experience. Join us for a traditional snack workshop where a local chef will teach you to prepare pintxos, or partake in the Spanish custom of sharing tapas on a walking tour through Bilbao. Speaking of tapas, this style of small, shareable plates is possibly Spain’s most famous contribution to world cuisine. In Spain, tapas can take many forms and are served in bars all across the country. Tapas are Andalusian in origin, so make a particular point of ordering them in ports like Seville and Almeria. Another famous Andalusian dish you’ll want to try while there is gazpacho, a refreshing, chilled soup made with raw vegetables and stale bread. In Barcelona, seek out traditional Catalan cuisine to indulge in. Pork, particularly in sausage form, is a key ingredient in Catalan cooking, as are seafood, fish, and vegetables. Pan Con Tomate is a Catalan staple – toasted bread rubbed with fresh tomatoes, olive oil, garlic, and salt. And don’t forget to try jamón serrano, a dry-cured ham, paired with local Catalan cheeses. To dive even deeper into Catalan cuisine, join us for a tour of Barcelona’s local flavors—culminating with an unforgettable meal. Another quintessential Spanish dish to try during your cruise is paella. This rice dish originated in the Valencia region, so order it there if you can. Even better? Have paella for lunch at a traditional Valencian farm house, learn how to make it yourself, and experience warm local hospitality on an amazing shore excursion with us. In addition to great food, Spain produces incredible wine, craft beer, vermouth, and cider. Two of Spain’s most prominent wine regions are Rioja and Cava. Rioja produces red, white, and rosé wines. The most popular is Tempranillo, a smooth red wine with medium tannins and fruity, earthy notes. Cava refers to both the famous Spanish sparkling wine, and the region where it is produced (like Champagne). It originated in Catalonia and is made in the traditional Champagne method – thus making it more similar to French Champagne than its Italian counterpart, Prosecco. Spain is certainly one of the most alluring travel destinations out there for wine aficionados. Learn more about it by checking out our blog on the best travel destinations for wine lovers. 3. Experience Spain’s famed nightlife. When is dinner? In Spain, the answer is no earlier than nine o’clock p.m. Ten would be better. Spain has a night owl culture. Dinner lasts until at least midnight, and in summer months socializing after dinner lasts well into the night. Cap off an evening out by enjoying some churros (fried pastries) with a mug of thick hot chocolate. Before your late dinner onshore, partake in the popular Spanish tradition of the evening paseo. This leisurely stroll is a quintessential part of Spanish culture for people of all ages. Not only is it a great way to join in a cultural tradition, but you’ll find that a city has a special “magic hour” glow at dusk and an atmosphere distinct from that of daytime. Nightlife is an important part of Spanish culture. From eating tapas at cozy bars to watching flamenco performances at intimate tabloas, to truly see Spain you must see it after dark. Ibiza is particularly renowned for its lively nightlife scene. The trendy hotspot is a favorite with sunbathers and jet setters thanks to its stunning beaches and stylish oceanfront clubs. After spending the day exploring Ibiza on an off-road adventure, dance the night away, or settle in at a cozy café to enjoy a cocktail and the sunset. Whether you’re an architecture buff or just love snapping Instagrams of cool buildings, you’re going to love Spain. Barcelona was the playground of famed architect Antoni Gaudi, and no trip to the city would be complete without visiting his most renowned works. At the top of that list is the stunning Sagrada Familia. Construction of the basilica began in 1882 (Gaudi himself took the project over in 1883) and it remains unfinished today. When asked about a completion date, Gaudi once famously remarked “My client is not in a hurry.” Perhaps that’s true, but you’ll be happy to hear it has entered the final stage of construction and is slated for completion by 2028—over 140 years after work began. If you’d like to see inside the basilica, you’ll want to book your tickets in advance. A twenty-minute walk from the basilica will bring you to La Pedrada (also known as Casa Milà), a modernist building and UNESCO World Heritage Site. Constructed between 1906 and 1910, it was the last private residence designed by Gaudi. Finally, don’t miss Parc Güell. This incredible garden complex is home to Gaudi’s own residence, a plaza, and mosaic trendadis – surfaces covered with broken ceramic tiles. It’s the perfect place for a sunset stroll and to admire city views from the central plaça. Antoni Gaudi made Catalan Modernism famous, but there are other styles of architecture present in Barcelona as well. Visit the city’s Gothic Quarter to feel a sense of Barcelona’s history. Particularly after dark, the narrow, winding streets of this neighborhood have an enchanting, enigmatic atmosphere. Make sure you visit The Cathedral of the Holy Cross and Saint Eulalia (also known as the Barcelona Cathedral), a highlight of the district’s Gothic architecture. Architecture is such a key component of any visit to Barcelona that seeing the works of Gaudi and exploring the Gothic Quarter both landed on our list of the top five things to do in Barcelona. One of our favorite ways to explore the historic streets of Barcelona is by bike—and we'd love to bring you along for the ride. Elsewhere in Spain, the architecture is just as impressive. Seville is one of the most interesting cities for architecture and four of its most famous sites are easily visited via one simple walking route. Begin in the city center at Plaza de España, inside Parque de María Luisa. The semicircle of buildings, which were completed in 1928, is a unique mix of Renaissance Revival and Moorish Revival architecture that is distinct to this region. From the plaza, it’s less than a ten-minute walk to the Royal Alcázar of Seville. The Alcázar was originally built as a fort in 913 AD but has been expanded and renovated many times over several centuries. The result is a compelling complex of palaces, chapels, fountains, and gardens. Just a quick jaunt from the Royal Alcázar is the stunning Seville Cathedral. Completed in the early 16th century during the height of Seville’s success as a trading center, this is the largest Gothic cathedral in the world and the third-largest church in the world. The cathedral’s bell tower, La Giralda, is Seville’s most famous landmark. For beautiful city views, take a climb to the top. Finally, walk from the Seville Cathedral to the Metropol Parasol, about ten minutes. This controversial structure was built in Seville’s Old Quarter in 2011 and claims to be the largest wooden structure in the world. The building houses an underground museum, a market, an open-air plaza, and upper terraces that offer great views of the city. The Metropol Parasol’s design, cost, and location have been a contentious subject in Seville. Other architectural wonders you can look forward to visiting during a Spanish voyage include the gothic Saint Mary’s Cathedral and the Llotja de la Seda (Silk Market) in Valencia, the massive La Seo gothic cathedral and Moorish Palacio Almudaina in Palma de Mallorca, and the Moorish Alcazaba fortress in Malaga. 5. Bask in the sun on some of the world’s best beaches. During your trip to Spain, take a break from exploring the country’s rich cultural heritage to relax and unwind on a sun-kissed beach. Spain boasts some of the best on the Mediterranean. Itineraries calling on Malaga, Spain, will bring ample opportunities to hit the beach. Malaga is the dynamic capital of Spain’s Costa del Sol. That this seaside retreat’s name translates to “sun coast” should tell you something about the weather. Leave the city to visit smaller coastal beach towns, or catch some rays closer to the city center at Playa de la Malagueta. Ibiza is just as famous for amazing beaches as it is for its thriving bar scene. Beach bums will want to pay a visit to Santa Eulalia, a charming resort town with beautiful white sand beaches and a bustling promenade lined with restaurants and cafes. If your voyage calls on Palma de Mallorca, visit the inviting Ca'n Pere Antoni. The small beach lies just beyond Palma’s beautiful cathedral, making it easy to visit during a day of sightseeing. Stroll along the promenade or grab a bite to eat at one of the many beachfront restaurants. For a real urban beach experience, visit Barceloneta Beach in Barcelona. This gorgeous stretch of beach is surrounded by one of Barcelona’s lesser-known neighborhoods. Barceloneta was once a fishing village and has retained that rustic charm. Visit the local market, dine on fresh seafood at a restaurant along the boardwalk, and enjoy the warm Mediterranean sun at the beach. 6. Feel inspired by Spanish art. Diego Velázquez. Francisco de Goya. Pablo Picasso. Salvadore Dalí. Spain has produced many artists over the centuries that are as incredible as they are influential, and many of their works are on display across the country. Art lovers will enjoy visiting Malaga, the birthplace of Picasso and home to the impressive Museu Picasso. Picasso’s family members donated 155 pieces of art including paintings, drawings, engravings, and ceramics to the museum. In fact, there are over thirty museums in Malaga, devoted to a variety of topics so broad you’re bound to discover something of interest. Learn more about Andalusian art at Museo Carmen Thyssen, or explore the world of contemporary Spanish art at Centro de Arte Contemporaneo. For those less interested in art, there are museums devoted to wine, cars, flamenco, football (soccer, to Americans), and more. Barcelona, too, offers visitors a plethora of museums to choose from. Their Museu Picasso boasts the most extensive collection of works by Picasso, with an astonishing collection of 4,251 items. The collection is housed in five adjoining medieval palaces and is the city’s most visited museum. Museu Nacional d’Art de Catalunya, more commonly referred to as MNAC, houses a collection of Catalan art spanning the 12th to 20th centuries. The museum is most famous for its incredible section on Romanesque art, featuring beautiful murals that were salvaged from dilapidated churches. A Spanish city that should be on the bucket list of every art lover is Bilbao. The Basque Country city has been home to the world-renowned Guggenheim Museum for the past twenty years, during which the city was completely revitalized. Acclaimed architect Frank Gehry designed the iconic titanium building, and several massive outdoor art installations like Jeff Koons’ Puppy and Tulips works make the museum’s exterior as interesting as the interior. 7. Embark on an outdoor adventure. Many of Spain’s most renowned attractions are cultural. Art, architecture, history, cuisine. But it’s also a fantastic travel destination for anyone who loves adventure and the great outdoors. If beaches and nightclubs aren’t your cup of tea, spend your day in Ibiza visiting the Can Marça Caves—an eerie underground wonderland that is over 100,000 years old. Enter the depths of the limestone caves to see stalagmites and stalactites, subterranean lakes, and waterfalls. A light show illuminates the caves in bright colors, adding to the mystical atmosphere. 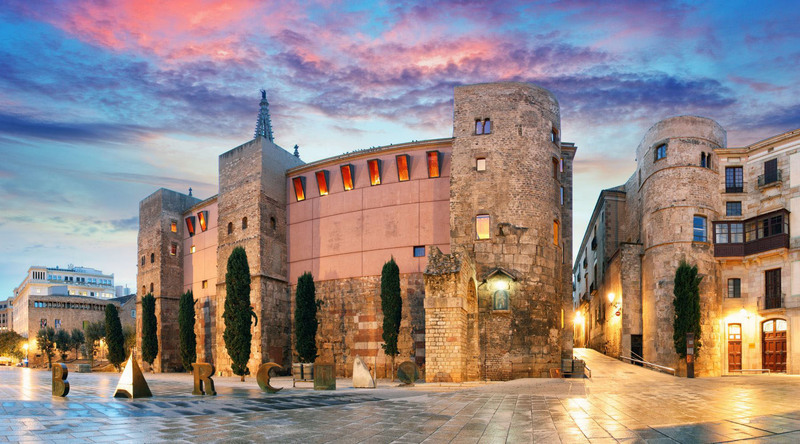 Palma de Mallorca is also home to famous mysterious caverns, the Caves del Drach. The name translates to “Dragon Caves” and the subterranean landscape is so otherworldly that you’ll feel as though you just might run into a dragon during your visit. This series of four interconnected caves—Black Cave, White Cave, Cave of Luis Salvador, and Cave of the French—may date back millions of years. Within the caves is Martel Lake, the largest underground lake in the world. In Almeria, outdoor enthusiasts should spend their day at Cabo de Gato-Nijar Natural Park. The UNESCO Biosphere Reserve is a natural playground of beaches, volcanic rock formations, and a protected coastal area of coral reefs that host abundant marine life. It’s a great place for hiking, bird watching, kayaking, and snorkeling. Bonus: Spend extra time in Lisbon. Lisbon is in Portugal, not Spain, making this a bonus suggestion. However, our country-intensive Iberian Peninsula voyages embark or debark in Lisbon and it’s a city worth getting to know. To help you plan your time there, we’ve put together a list of the top five things to do in Lisbon. Now that you know exactly how to spend your time in Spain, it’s time to join us in La Piel de Toro. Browse our unique, immersive itineraries to start planning your trip today.